Good data help us make good decisions. Their importance seems obvious, even self-evident. But then again, data can't speak for themselves. We lend them meaning. What data mean depends to a great extent to how we use data, how we understand those uses, and how its use helps us to care for the things--and the people, the places, and the non-human species--we care about. We rarely think of data as having a story, much less an interesting one--unless of course we are latter-day Gradgrinds. As English novelist Charles Dickens's famously tedious school superintendent Mr. Gradgrind pronounced, "NOW, what I want is, Facts. Teach these boys and girls nothing but Facts. Facts alone are wanted in life. Plant nothing else, and root out everything else." A little more than a year ago, a small team of teachers, students, and many volunteers set out to explore the kinds of stories we might tell to make American federal climate and environmental data come alive. We set ourselves the challenge of imagining data itself as alive--as living in and connected to the world. And so we began to research data's lives and to tell stories that didn't, in the words of the heartless Mr. Gradgrind, "root out everything else." We found stories that instead showed data's connections to a diversity of lives in our communities. Archivists commonly use life cycle models for records management. Data, and records more generally, are widely understood to be living organisms; their care begins at creation, extends to access, and typically ends at preservation or destruction. Living data and living archives inhabit ecosystems shaped by a variety of actors, including deniers of various inconvenient truths. Data can die deaths both unnatural and not. 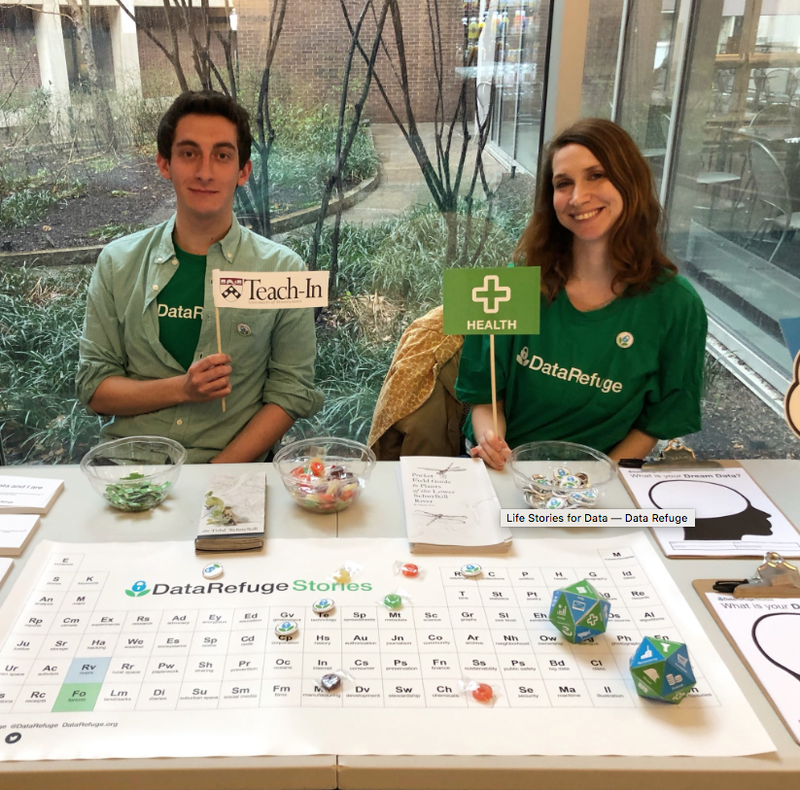 In Philadelphia and with research communities on our college campus as well as at national conferences across the country, we've begun to explore the different kinds of life stories we might narrate to bring data to life. Now, we're asking for your help. Alex Anderson and Emily Romick at Penn Nursing for Penn's TeachIn. We have not (yet!) written a data story in the mold of a Dickensian novel. But our work so far has convinced us that good data life stories can defend data--not just from the Gradgrinds of the world but also from those who would deny their very existence. We have been experimenting with various kinds of life writing, challenging ourselves to write biographies of data sets. We've asked ourselves, if a data asset could talk, what would its voice sound like? What would a birth announcement for new data look like? How about its obituary? As we move beyond our first prototyping phase, described more in the second installment in this series of brief essays, "Data Re-Mediations," we invite you, beyond Philadelphia, to join with us in imagining data's life stories, from the short to the very long. You can learn more about the stories we're telling and the grant-making in support of your future data storytelling as well as the 2019 national data storytelling convening supported by the National Geographic Foundation. We hope you will join us in keeping good data alive by bringing its stories to life.